The death toll caused by the Sichuan earthquake is reported to be 15,000 already. The number is still rising. A lot of school children were amongst those tragically killed when their school buildings collapsed. We have spoken to the local authorities and understand that water, clothes, medicine, and food are URGENTLY needed. To help children and orphanages in the disaster area, Mother Bridge of Love (MBL) is making an urgent appeal to all our friends and colleagues to make a donation to support the disaster relief efforts. Your generous help would be much appreciated. Last year, we donated money to the flood-hit area of Sichuan. The money we raised through Edinburgh Marathon was used to Tongjiang to build up a collapsed school kitchen in helping children back to school earlier. 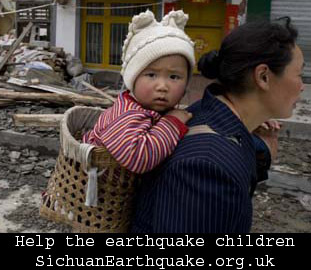 100 % of donations received will once again be sent to Sichuan to provide much needed assistance to children. Our focus will be helping children and women to recover from physical (food, water, and medical care immediately) and physiological damage (Counseling in a later stage). The donation will be sent to the local schools and mothers and carers directly through our local advisory volunteers. The money will be used to buy the most urgently needed goods and rescue the children still underneath the debris. We will report back the progress from the front line. Posted in News | 4 Comments » | Read more..